The API 525 is a “feedback” type compressor first circulated in the 70s. The user can change dynamics on the fly without level alterations thanks to numerous mechanisms: a provided input (threshold) control and output (make-up gain) control, along with an additional “Ceiling” fine-tune function which can intensify gain reduction (lower threshold) while concurrently raising output level to match. Attack time is as fast as 15u/s. A compression/limit switch sets ratio at either 2:1 or 20:1. Two switches offer four auto release modes: 0.1s, 0.5s, 1.5s, & 2.0s. An inverse vocal energy curve filter in the detector is injected by a De-Ess function for active sibilance/pop reduction. Primary blue prints and spec control from the API archives have been the basis of the API 525’s design. High frequency / full bandwidth content is emitted faster than lower frequencies – the frequency dependent release time variation is for natural envelope tracking. Chosen to catch the fastest peaks, attack is immovable without “pumping”. 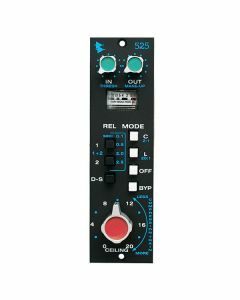 The API 525 applies “vintage” dynamics control and an easy to use multi-function control set which is equally as useful as tracking, mixdown or program compressor/limiter. As is the case with all other 500 series modules the API 525 has a hard-write bypass switch, a balanced input and a pinout. For multi-channel compression, two or more 525s can be chained. The API 525 Compressor demonstrates the dependability, longevity and uniformity characteristic of all API products and makes use of 2510 and 2520 op-amps. Power Requirements: ±12/18 Volts/DC, @80 ma.